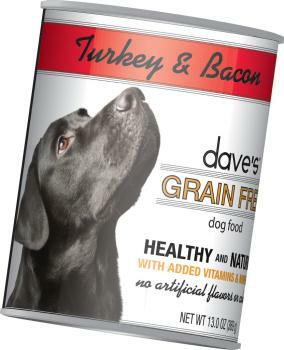 Dave’s Grain Free™ Canned Dog Food Formulas are loaded with real meat and a great taste your dog will love! These are healthy, grain free, all natural diets with added vitamins and minerals, no artificial flavors or colors. Oliver is a picky picky eater and thank goodness he loves this and no allergy side effects! Yay!!!!! Very rich & tasty (according to my lab)! My lab loved this Turkey & Bacon, but it was a little to rich for his stomach. It's a great product & I recommend it to everyone. But unfortunately, my dogs sensitive stomach sometimes doesn't allow such a rich food. And I was so excited to have another choice for him too! But it just wasn't meant to be. But I give it 5 stars anyway because it's a great product & good for a dogs skin! Love Dave's...his creation is personal! WOOF! 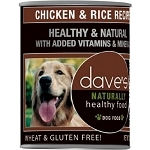 Not only does my four legged friend love Dave's pet food but licks the bowl clean! Dave has a personal thank you on each can of food which is really nice! This is a super healthy way of feeding your pet delicious meals! Everything tastes better with bacon and this product is no exception. Both of my pets enjoyed this mixed with their grain free dry food. This is a wonderful new addition! My dog never grows tired of it. I always get at least 6 cans of this per week! Turkey, Turkey Broth, Bacon, Turkey Liver, Guar Gum, Cassia Gum, Carragenan, Salt, Potassium Chloride, Minerals (Iron Amino Acid Chelate, Zinc Amino Acid Chelate, Cobalt Amino Acid Chelate, Copper Amino Acid Chelate, Manganese Amino Acid Chelate, Sodium Selenite, Potassium Iodide), Inulin, Vitamins (Vitamin E, A, B12, D3 Supplements, Thiamine Mononitrate, Biotin, Riboflavin Supplement), Choline Chloride, Flaxseed Oil, Taurine.